So…this is going to take some explaining. Haruka, the mad scientist of Homura’s Crimson Squad, is up to her usual experiments again, brewing up mysterious concoctions with unknown effects. Unfortunately for her fellow shinobi, she’s chosen the local arcade she works at as her laboratory, storing her experiments in the bathroom. After an accidental outbreak infects five of her shinobi friends, she learns that her latest concoction can transform those exposed it into animals, at least mentally. Now, with Asuka, Yumi, Yomi, Ryona, and Murasaki causing wild havoc in and around the arcade, Haruka has devised a way to return these shinobi to their senses – the mystical Peach Ball. Applied to a subject’s body repeatedly, with the proper vibrational force, it can undo the effects of her experiment. Conveniently, it’s just the right size for a pinball table. Now all Haruka needs is a skilled assistant to operate the table, bopping each shinobi girl with the ball until she comes around. 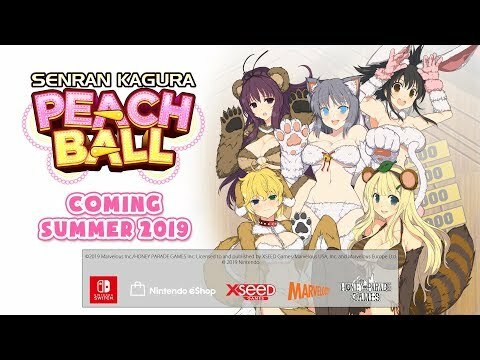 The upcoming Senran Kagura: Peach Ball Switch release date is Q3 2019 in the US and the UK. Notify me when Senran Kagura: Peach Ball is available.